Designed for low voltage power, control and auxiliary applications where mechanical protection is not needed. Offers a significant benefits compare to conventional armoured cables due to its small outer diameters and reduced weight and can be installed on cable tray, ladder and in single, bunched and trefoil configurations. 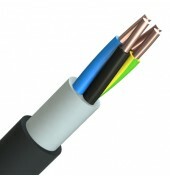 Plain copper conductors to IEC 60228, XLPE insulation, filler, black or grey PVC outer sheath.